I decided at the last minute to join in Amy Johnson Crow’s 52 Ancestors in 52 Weeks for 2018. I participated in 2014 and had fun getting to know more about some of my ancestors and also revisiting some of my research on others. Since I haven’t written a post on this blog in over a year, I thought this would be a great way to get me writing again. I’ll write two posts this week to catch up. For this challenge, we’ll have a topic prompt each week. For the first week of January, the prompt is “Start.” One of Amy’s suggestions for this prompt is to write about the person who got us started in genealogy. 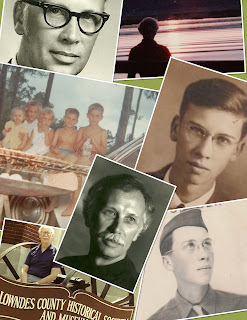 That person would be my dad, Albert S. Pendleton, Jr.
A collage I made of my dad, Albert S. Pendleton, Jr.
As far back as I can remember, my dad was interested in family history. I loved listening to the stories he would tell my siblings and me about our family, both about his and my mother’s. He wrote the Lowndes County Historical Society (LCHS) newsletter for a few decades and wrote the “Way Back When” articles for the Valdosta Daily Times that were later compiled into three volumes by the LCHS. He and Susan McKey Thomas wrote a book about Doc Holliday (Susie’s cousin), titled In Search of the Hollidays: The Story of Doc Holliday and His Holliday and McKey Families (Valdosta: Little River Press, 1973). Dad wrote a memoir in the 1980s (I’m so glad he did! ), and before he died, he asked me to look for the document. I found it scattered in a few places in his paper-strewn office. Thank goodness he’d typed his memoir, because no one can read his handwriting! And this was before computers. I retyped his memoir a few years ago so I’d have a digital copy. I intended on adding photos and having it printed to give to family members, but I haven’t done that yet. I’ve let so many other things take my attention. My dad did a ton of research, so after he died, I began organizing his documents. It was slow going since I could only work on it when I visited from out of state. Now I live in my childhood home, taking care of my mother. There’s still tons more of my dad’s papers now sitting in boxes that need to be filed. I’ve scanned a lot to share with cousins, but there’s still more to go. Not to mention all the photographs! I’ve barely touched the surface. Dad was good at writing cousins and staying in touch over the years. 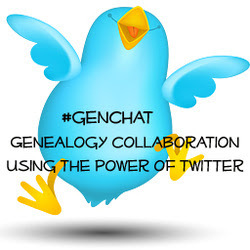 He did all of his research before the Internet and Google and ancestry.com (among other genealogy websites). He’d actually call people, visit, or write letters asking for information. I wish I could share with my dad what I’ve found out about his family lines in the past few years. He would be amazed. Thank goodness I do have the Internet at my disposal!